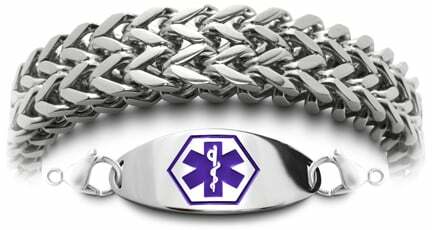 What do I need to know to get the best medical bracelets? It's scary buying a medical ID bracelet for the first time. What goes on the tag? What's right for me? How to measure. Why custom, handmade is better? Do I get beads or chains? How to prevent Mom with Alzheimer's from getting lost? And are you like the 150 million that need a medical bracelet, but hate those ugly dog chains? So how does it work and what should I do? See over 600 styles. Ask your doctor to explain your illness so you understand what to say and how to abbreviate conditions and medications. Ask what critical issues need to be listed, and in what order of importance. • Medical conditions are usually the most important. • Arrange your medical issues and drugs in order of importance because medical responders may only have seconds to make life saving decisions. • Names and phone numbers are the least important as responders and doctors do not have time to make calls. Blood thinners are usually best to be listed on the top since you could be bleeding internally due to trauma: ON XARELTO, ON PLAVIX, ON COUMADIN or ON BLOOD THINNER. List All Allergies to medications, foods and anything else that might cause an emergency, or what needs to be said to get you through a crisis such as NO NUTS, NO PCN, NO MORPHINE, NO BEES-USE EPIPEN. Artificial Knees, Hips & Spine Injuries—specify where located: R-KNEE: TKR (total knee replacement), L-HIP: THR (total hip replacement), SPINE MESH-SCI (spinal cord injury). Lymphedema Patients cannot have blood pressure taken or needle punctures such as R-ARM: NO BP/IV, NO NEEDLES/LABS. Artificial heart valves & heart conditions: List CHF (chronic heart failure) or CABG (coronary artery bypass graft). Bariatric Bypass Surgery: Tell not to insert a blind gastric tube to avoid stomach punctures such as: GASTRIC BYPASS, NO BLIND NGT. Transplant Patients need to specify the type of transplant and anti-rejection meds such as heart, kidney or lung transplants: KIDNEY TX, HEART TX, ON CELLCEPT, ON PROGRAF. Allergies to Med Classes: NO OPIOIDS, NO SULFA, NO CILLINS, NO MYCINS. * "Type I" and "Type II" diabetes – later adjusted to remove the capitalization and change the Roman numerals to Arabic, thus becoming type 1 and type 2 diabetes. These are the presently-used terms. - Dr. Bill Quick, Health Pro, HealthCenral, Published On: August 29, 2013. Why use ON and NO: Paramedics and doctors need to know quickly if you are taking meds, or can't take them. That's why "ON" tells them that you must take a medication that is critical to your health. For example: ON COUMADIN. On the other hand, the word "NO" tells them that you're allergic to specific meds, foods or even anaphylactic. For example: NO MORPHINE or NO SHELLFISH. Make sure you tell them if you're taking or can't take meds to avoid any confusion. Space is at a premium on an ID so be sure to shorten the information. Instead of saying "TAKING PENICILLIN", you can say ON PCN. It's too long to say "DIABETIC TYPE 2 TAKING INSULIN" when you could say DM2-INSULIN or DIABETIC 2-INSULIN. First responders and doctors are trained to know the shorthand. See Abbreviations. Medical Conditions don't have to be long to be clear to medical people. "KIDNEY TRANSPLANT" can be written as KIDNEY TX. "ATRIAL FIBRILLATION" is AFIB. "AORTIC VALVE REPLACEMENT" is AVR. Emergency Phone Numbers are stated as "ICE" which stands for "In Case of Emergency". This would precede the number: ICE 888-234-5678. It's best to have a cell number of a family member or close friend who knows your medical issues. However, don't count on any phone number to be called by paramedics or doctors as they are usually too busy saving your life. So make sure all critical information is stated on your ID Tag. Lost wallets and broken phones may prevent retrieving your medical information in emergencies such as car accidents. Just because you have a medical card in your wallet does not guarantee that your wallet will be found or searched. Even your cell phone may be broken or lost in the weeds. That's why you can only rely on a medical ID that's securely attached. Cellular Rescue Services with buttons or fall detection are great for people at severe risk, but may not be enough in every medical emergency. Pressing a button and having your fall detected gets medical services to you quickly. However, once the emergency people get there, will they be completely informed about your pre-existing conditions? In speaking with paramedics across America, they say they are usually too busy to make phone calls if that's required. And, if the service can speak through the speaker, the information must be given quickly without delay otherwise they can't wait. What if you're in a no-service cell zone—where is the information then? Having a medical ID bracelet is usually the quickest, surest way to convey your pre-existing conditions, your allergies, and what meds you are taking—right there on the spot—when every second counts! It only makes common sense to protect yourself in every way possible—a cellular service and a bracelet! 98% of medical USB's and QR Codes are useless in America. After researching what paramedics, hospitals and doctors will actually do, it turns out that in a middle of an emergency they have no time to access the equipment needed to read personal USB's and QR Codes on medical bracelets. As a matter of policy, most hospitals and first responders are forbidden to insert any private media into official computers for fear of viruses. Also in emergencies, USB's take too much time to load and read. Most paramedics are not allowed to use their personal or hospital phones to read QR codes because of policy and HIPAA compliance. In most cases, there are "no universal standards" and no specialized scanners to permit reading these codes. Also, be aware that most QR codes require a cellular connection to the internet to retrieve your medical information. Mountains, valleys and heavily forested areas can block this service. At this time, there is no nationwide Federal hospital standards to coordinate and read these devices. If you intend to use one of these devices or codes, make sure your area hospitals and EMT's can read and accept your data before investing in this technology. Keep in mind, if you venture out of your area, it won't work. The problem with 800-number medical data services. Any service providing important medical information is helpful. However, paramedics are usually too busy saving lives and unfortunately have no time to make calls to any phone service. Even doctors in emergency rooms are also too busy to call. It's only when an unconscious person comes out of the ER—that's when nurses usually call for more information. Having a number for a medical data service on your ID tag can help—after the emergency is over! It's always better to have all "critical information" firmly attached to you. If you measure our special way, you'll get a custom, handmade bracelet that fits perfectly with just the right amount of room for comfort. • Get a soft tape measure. • Wrap it around the wrist just below your wrist bone and between your hand. Don't measure on the elbow side. • Pull the tape measure skintight, leaving no extra space. We need an "as-is" size. • If you leave extra space thinking that you don't want it too tight, it will be too big and may fall off your hand. We already account for the correct comfort room required. Up to now, finding the right medical bracelet has been a hit-and-miss affair. You pay good money only to find it doesn't fit, it doesn't last, and unless you spend a fortune, it looks like it belongs around your dog's neck. But you're up against it because your doctor says you must have one to survive yet another day. Wearing in Water divides medical bracelets into two categories: 1. WaterWear Bracelets® and, 2. Fashion Beaded. WaterWear Bracelets® can be worn in water and Beaded cannot. Precious Metals and Designer Stainless can be worn in showers, baths and swimming. However, if you're swimming in chlorine and salt water, you may want to avoid Precious Metals as they can be etched by chlorine, salt and even chemicals like perfumes and sunscreens. In some cases, people with high acid skin can even damage gold, silver, platinum, and rhodium. Upscale/Dressy fits our high Fashion Beaded bracelets which can be very sophisticated when dressing up for special occasions. Even our Precious Metal, Tennis Bracelets and Designer Stainless have very dressy styles. Heavy Activities create high stress and rough wear situations requiring stronger materials such as heavier chain styles in Designer Stainless. Even stainless steel can be broken unless you choose wisely for your lifestyle. At Work the style you pick is determined by what you do. If you're a Chef, you'll probably want a WaterWear Bracelet®. If you have a desk job, you can go with just about anything that strikes your fancy. If heavy construction is your profession, than choose a more rugged stainless steel style. Alzheimer's & Dementia patients may eventually become hard to handle and may not want to wear, or keep wearing a medical bracelet. This requires specially designed unremovable bracelets built to be secure. Precious Metals at Medical ID Fashions are in Gold and Rhodium. Rhodium looks just like Silver except it is much harder and more scratch resistant. Rhodium is a rare precious metal that is often used to plate sterling silver and found in high-end watches. Be aware, all precious metals can be compromised by chlorine, salt, chemicals and high acid skin. If you swim in chlorine or salt water, then always use fresh water to wash off gold and rhodium immediately after swimming. Designer Stainless bracelets are much more stylish than the stereotypical and ugly drugstore chains that look like something Fido would wear. To correct this, we go all over the world for styles that you'll never see anywhere else. They can be very delicate or they can be very rugged. It's up to you and your lifestyle! We offer Designer Sets and Alzheimer's Sets. In both cases, each bracelet style comes with the plate and engraving all included at one low price. For ALZ we've designed exclusive sets that use a one-of-a-kind "sisterhook" clasp that's virtually unremovable. This is often seen with people that are on chemotherapy and/or taking anti-rejection meds for organ transplants. It does not rule out unique medication combinations. It can also occur naturally for some people that have very high acid skin. If you believe you fit one of these conditions, or have experienced problems with ordinary metals, it's best to only consider all-beaded bracelets with no metal parts, or select stainless steel.